Seismic Network | Colorado Mesa Univ. 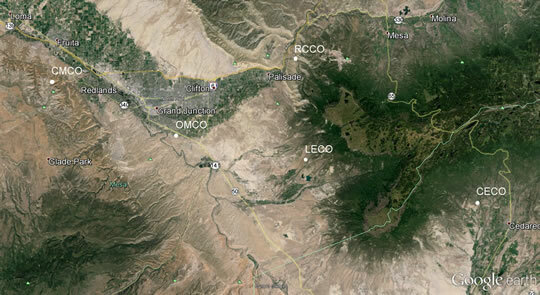 The Colorado Mesa University Seismic Network (CMUSN) is an ongoing research project of the Geosciences Program at CMU. The primary goals of the project are to collect and disseminate data related to possible small seismic events in the general area of Western Colorado and Eastern Utah. Dave Wolny, alumnus and current Adjunct Professor, and Dr. Verner Johnson, Professor, started collecting seismic data with a single seismometer in January, 1994. The network now has five stations thanks to seismometer donations, volunteer work and financial support from the Grand Junction Geological Society and private individuals. A seismic event database containing the dates, magnitudes, depths, interpreted .gif files of related seismic traces and epicenter locations is available: Seismic Event Database. Specific questions about these events should be directed to Dave Wolny.